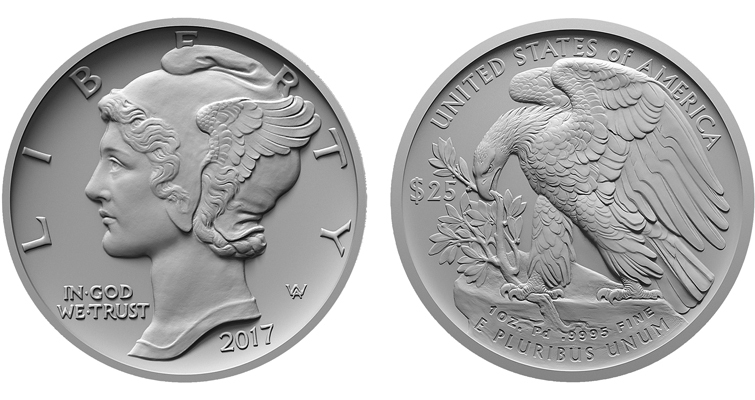 WASHINGTON – The United States Mint today announced it will begin for the first time sales of a one-ounce American Eagle Palladium Bullion Coin to Authorized Purchasers on September 25. As with American Eagle Gold and Silver Bullion Coins, American Eagle Palladium Bullion Coins will be made available through the United States Mint’s Authorized Purchaser network. Authorized Purchasers consist of major coin and precious metals wholesalers, brokerage firms, banks, and other participating financial intermediaries. American Eagle Palladium Bullion Coins will be made available to United States Mint Authorized Purchasers at a 6.25 percent premium over the prevailing price of palladium. Public Law 119-94 requires the Secretary of the Treasury to mint and issue palladium bullion coins weighing one troy ounce of .9995 fine palladium, with a face value of $25.00, in such quantities as the Secretary determines appropriate to meet demand. Only coins in the one-troy ounce size are permitted; fractional sizes are not authorized. Title 31 U.S.C. Section 5112(v) authorizes the Secretary to mint and issue proof and uncirculated versions of the one-ounce palladium bullion coins. As mandated by the law, the obverse design of the palladium coin is an adaptation of Adolph A. Weinman’s ‘Winged Liberty’ design used on the obverse of the so-called ‘Mercury dime,’ and the reverse design is based upon Weinman’s Eagle design for the 1907 American Institute of Architects (AIA) gold medal. In developing the coin, the United States Mint was able to utilize the original reverse plaster of the AIA gold medal. This is the first time that Weinman’s AIA design appears on a U.S. coin.